Wafflemeister has opened their latest outlet in Kuala Lumpur... not that they have many outlets worldwide as they only have 8 outlets. 5 are in London (South Kensington, Oxford Street, Portobello Road, Baker Street, Harvey Nichols Knightsbridge). 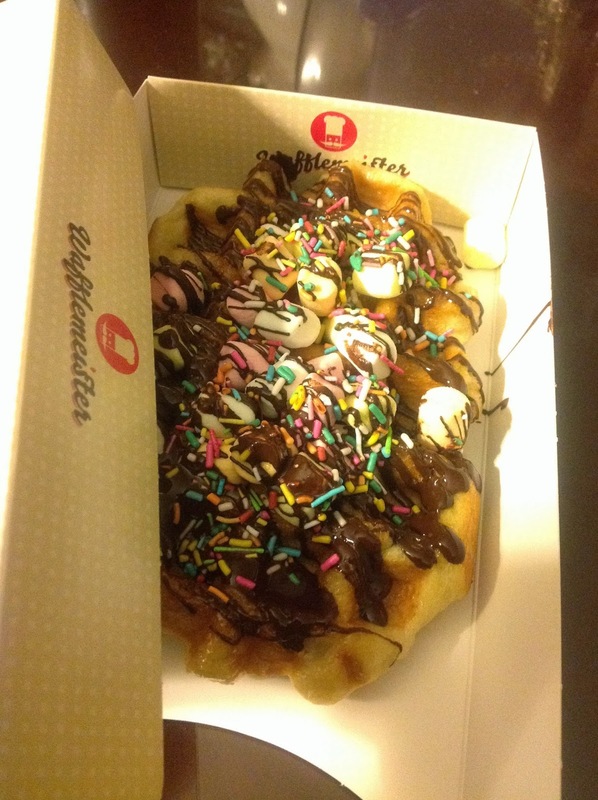 2 are in Abu Dhabi: Al Wahda and Abu Dhabi Mall and Malaysia's very own Wafflemeister outlet over at Suria KLCC. Decided to drop by for their Waffles which comes with a variety of toppings. Slightly pricey but worth every Ringgit. The waffle itself is nice and chewy. Not too hard and sweet. According to their website, the dough for all of their waffles are made using a family recipe from Belgium back in the 1950s. You can choose the chocolate sauce: white, milk or dark chocolate. You know which one I chose right? Apart from waffles, they also have homemade gelato, coffee and milkshakes. INFO: Wafflemeister, Suria KLCC (Petronas Twin Towers) 3rd Floor. Check out their Facebook.